And so here is the simple answer…….I don’t. Yep. I don’t. 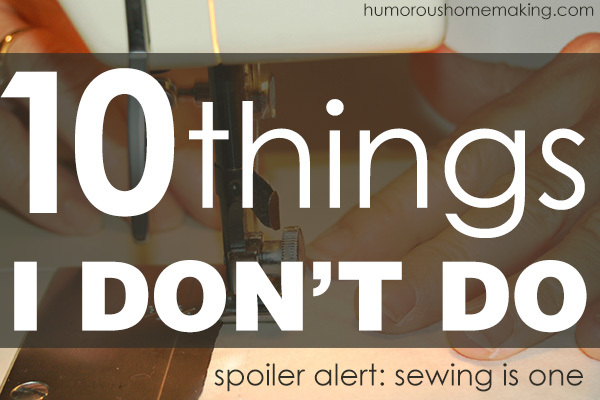 So, today I’m going to give you a little glimpse into the things that I don’t do around here. This should be interesting. Yeah, yeah. I know I should do it…..but here’s why I don’t. My allergies usually give me a fit afterwards. I sneeze all day and I just don’t feel well. I do realize that if I did it on a regular basis that it wouldn’t get bad and my allergies would probably be fine…..but let’s be honest here people. I don’t really make the time to work in dusting on a regular basis. I joke around and say I had kids so they could dust the house. My mom always made me do it, so it feels justifiable. Sorta like payback. When people come over, I tell them I’m performing an experiment to see exactly how long it takes before the dust gets so high that it actually caves in on itself. So far, no caving. Experiment in process. I have good intentions, I really do. I give myself a pep talk about how flossing every day is great! And I do it for about three days…..and then I get lazy. Really, flossing daily just sorta annoys me. I feel I could be doing something more productive with my time….like scrubbing a toilet or cleaning up doggy puke. Plus, when you floss it always seems to get stuff all over the mirror and then that just gives me something else to clean up. Double whammy. Annie, however, loves to floss. Sometimes to occupy her, I just give her a piece of floss. Who needs a battery operated toy? Give the kids floss, baby! By now you probably think my house is a total junk pit….but it’s really not. I keep a tidy house, but it’s not spotless. We LIVE HERE. I want it to look lived in, not like a museum. I can wash the windows, but when I do they look worse than when I started. They streak and look all nasty-fied. Barry is actually an excellent window cleaner and he leaves no spots…..sometimes he gets tired of straining to look out the windows and he has mercy upon me and cleans them. He’s such a nice man. I used to……to excess. But, that was in a life that I’ve tried to leave behind. I know about my tendency to OVER-exercise, so at this point it makes more sense for me to not do it. Yes, I love to walk early in the morning, but it’s difficult to get up, prepare breakfast, get the laundry going, get the kids ready, fix my 80s style bed-head, and THEN exercise. After all that, I feel as though I’ve already done it. Who needs a treadmill when you can run after small children and a dachshund? I don’t wash my car. My car is in a constant state of random raisins and random dirt. I don’t feel like cars are items to be babied……I sorta feel like cars are items to be USED. Especially Mommy Cars. If the kids need a snack in the car, I have no issues with that. If I run through a big ole mud puddle to avoid killing a random chicken, I have no problem with that. If I use the cupholder as a trash can, I have no issue with that…..Barry, however, has issues with my cupholder trash can. I really could use one of those car trash bag thingies. Really, that is a talent given by the Lord God himself….a talent that he did not bestow me with. When I think about sitting down to do something like that, it makes me want to run away screaming. I don’t like all the gluing, writing, placing, etc. AHHHHHHHHHHHHHHHHH! I just don’t make the patience or the time. Y’all, I cannot carry a tune. When we have family Bible time at night, we always sing. Sometimes my singing is so bad, Barry starts laughing…..and then I start laughing. Barry is in one key, and I’m in another key……a key that isn’t even on the piano. Most of my time now is spent singing Veggie Tales and Sesame Street songs…..and the kids don’t mind my singing – for the most part. Sometimes they do yell from the back seat “Stop it Mommy!” Who can blame them? They’re probably afraid of attracting all the neighborhood dogs. I do NOT do technology. It scares me. I hate it. I like writing my notes on paper with a pen. Yes, they still make paper and pens. I hate getting new phones, new TVs, new remotes…anything electronic. It means I have to learn to work it…and that means I have to read the instruction manual. That would give anyone a scrapbook ulcer. My children, however, are fine with technology. They love buttons and things that make noise. They can work my phone better than I can. Before Annie was two she could turn on the TV and use the remote. She must have inherited that gene from Barry…because sometimes I can’t even figure out how to turn my phone on. I’ll be honest…..I can’t shut up. I once went with Barry on one of his hunting outings…..and thought I would die of complete boredom. Really. I love being in The Nature…but I don’t love being in The Nature and not being able to speak. You sit still and wait…..and you don’t talk. I could be doing about 40 million other things but I’m sitting and not talking. What if I remember something important to tell him? What if I need to use the bathroom? What if I need to sneeze or blow my nose? Nope……hunting is NOT for me. Eating the venison, however, is totally for me. I don’t crochet or sew. 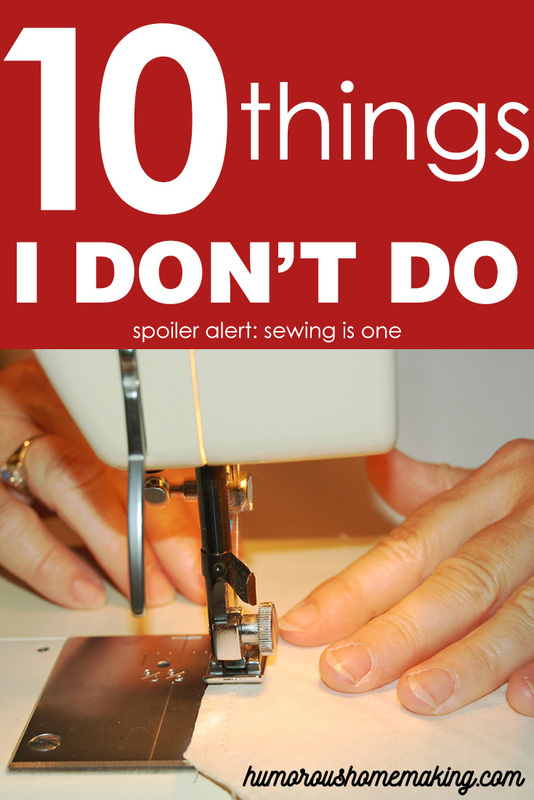 I read all these awesome sewing blogs, and I want to sew so badly…..but I just can’t. I bought a sewing machine and I have good intentions. I might learn one day. I have two friends, who really kick it at both of those things. My mom rocks her sewing machine……and I can rock an awesome needle injury. Sewing = blood…at least for me. Maybe God hooked me up with an awesome Mama so that I wouldn’t have to learn……so that she could do it all for me. And maybe God also let me be born to my wonderful Mama so that she could make my curtains and so that I could avoid ER visits.Yep, God knows what He’s doing. What is something YOU don’t do? I don’t do most of the things on this list. I dislike dusting so it happens very rarely. I do wash some windows- the living room and kitchen. I don’t fold my kids’ laundry. They get a clean pile that they fold (or not) themselves. I used to fold and then I saw that they just threw it in their drawers and it all got unfolded anyway. So liberating and it spares me the laundry despair that mothers of 7 children often experience. That does sound liberating – LOL. Great tip! Thanks Elizabeth Anne. Oooh brilliant – I love this idea! Thanks for sharing. I don’t sew anymore. When my children were young – now 37 and 24 I used to make them clothes – dresses, overalls, pyjamas, t-shirts etc but never with zips or collars. Never mastered that. I did knit too but can’t be bothered with that anymore and wool is too expensive. Polar fleece now that’s a good invention. Now I dread sewing. The sewing machine and I just shouldn’t be in the same room together as if I attempt to even do something easy it seems to always get it’s shuttle in a jam. I bought a new sewing machine but it was too complicated for me so I gave it away to family. I love your ant recipe. We’ve been inundated with ants in the garden and around the outside of the house. I love to put it out and then go back in a while and watch the sugar ant frenzy. It’s better than television and saving my plants from ant invasion. Ha ha! I’m glad you like it! I don’t do any of those things either!!!!! I am wondering how you blog though not doing technology. I just started and its really hard not being a techie. I hired someone to help me setup and design it. Now I need to learn some things myself and I don’t know where in the world to begin. Oh my gosh! 1 post and I already think I love you! i don’t do Smart Phones! Seems really strange for a blogger to not have one but I really have no desire to be married to my phone. When I drive, I pray so I don’t want a phone on getting in the way of my conversation with God. No,I just have been fine without it. The only drawback I can see is that I don’t have Instagram as a result, which is becoming more important in blogging world. Someday, I may get forced to buy one but so far, I am doing just fine! Technology is hard to embrace sometimes. 🙂 I always use the hashtag #techdumb for myself. Good! I hope Annie will learn and teach me. We are such kindred souls, just reading this today, and discovering I don’t do at least 8 of the 10 things you mentioned also!! My car is a total wreck, there’s dust everywhere, and my dentist always says “we’ve talked about flossing, right? !” And don’t even get me started on scrapbooking…. Amen – that’s what makes life interesting. I have been following your blog for a couple of months now. I am a semi-working Mom (I work while the kids are at school). I was a SAHM when the kids were smaller. Anyway, I have learned from the wisdom of MY Mother that some things have to slide. When you are all older, your kids are not going to remember that the house was dusty, or the windows were streaky. They are going to remember how Mom spent time with them, explored new things with them, made them delicious wholesome food, and taught them things that they will NOT learn in school. Like how to live a life with grace and that working hard to achieve what you want is a GOOD thing. That is what I learned from my Mom and hope that my girls learn from me. They are already appreciative of all the time I have given them. God Bless you, dear Stacy! Don’t sweat the small stuff. Flossing is over-rated. 😉 Thanks, Fae! Wow!! Most of these fit me to a T!! I do scrapbook though. Well, I used to scrapbook. Currently I am just a collector or scrapbook stuff and seems like I am always trying to better organize my large collection. Its a never ending battle. I don’t think it can be done. I don’t dust, scrapbook, hunt, crochet or sew either. My husband does the dusting, but he doesn’t do floors, so that’s my job. I hate cutting pictures, even though I know I can get more prints made. It just feels like I’m cutting up something that can never be replaced. And you would think I would sew, what with having a mom who had her own quilting business when I was younger. Nope. In fact, I just sold my sewing machine to her so she would have one to take on quilting retreats. My thing is embroidery. It’s easy to do and I can put it away in a nice little box where my son can’t get to it. My mom is a master seamstress – I keep saying that one day I AM going to learn. I AM!!!!! Hold me to that, okay? 🙂 Not even close, honey – not even close. We must be twins I. Another life cause I don’t do any of those things either. Hate (maybe too strong a word) all of them. Must have been intuition that I would love your book since we are so much alike. Yours is the only book I bought (get most recipes free) online and I LOVE IT!! 🙂 Nice to meet another kindred spirit! Thank you so much!! I so needed this laugh today and to think I found it from your wonderful granola that I am looking forward to making! God bless you and THANK YOU for keeping it real! Keepin’ it real….keepin’ it real. I finally found a car trash can I like: an empty kleenex box. And, yes, that came about because I used the last tissue in the box and then needed to throw it away. It sits nice and flat on the floorboard, self-closing opening, doesn’t tip over, and if something doesn’t fit in it, it really should be thrown away properly anyway. That’s my kind of trash can! I am like your father, I always say the Bible says “joyful noise”. I crochet,knit,sew,cross stitch,make home made cards and scrapbook. BUT, I am retired! When I first retired I made scrapbooks for both of my children from the time they were born until they got married. The book ended up being around 8-10 inches thick and they LOVE them. So, keep taking those pictures! 🙂 I take some every day! You know us all so well 😉 I don’t do most of these, I, too, just do not see the need. I have never been hunting, but always wanted to go. I can sew if I have to but not very well. You can go with Barry….I just can’t be quiet. Thank you for creating such a wonderful site! Because then you would not have an excuse to not dust!! But I agree, dusting is for people who don’t have small children… Who has time to dust?! Love it!! I don’t dust – it’s on my kids chore charts so it gets done once a week and I don’t have to do it!! Hallelujah! Cleaning the trash out of the vehicle is also on their chore charts since they are the ones making most of the mess anyway. Scrapbooking I love but I can only find the time when I go away somewhere else sans kids to do it. I love to fish, don’t mind being totally silent in the woods, but hunting is out of the question. Won’t eat venison, either. My Dad killed a deer and hung it on my swingset to drain when I was about 6 and told me it was one of Bambi’s relatives. Shudder. Technology is necessary but I don’t keep up with the latest and greatest. If it is still working it works for me. Windows drive my OCDness up a wall (ironing too for that matter). If it has one single streak (or wrinkle) I have to keep working on it. Thus one window can turn into an all day chore. Soooo …. I just don’t start cleaning them. My daughter enjoys cleaning the ones she can reach (with homemade safe cleaner) so I say more power to her. Singing – right there with you on that one. My kids have also asked me to please STOP. Lol!! Too bad cause I really really love to sing. I don’t exercise much, either. Would love to find a homeschool mommy friendly ZUMBA class, though. I knit at night so I don’t snack while watching TV. Sewing I am working on. Crocheting I can do but choose to not (it takes WAAAAYYYY too long for my impatient self). Lol!! I would add that I don’t iron. And I don’t make my bed (my hubby and I – after almost 13 years of marriage – still haven’t found a way to share covers, we each have our own set and how do you make a bed that way??). I also don’t weed my garden (landscape fabric all the way!). Hehe!!! I scrapbook as long as you count the huge box of stuff I bought and the 1 picture of me pregnant with my oldest (5 years ago)that I did put on a page. I don’t floss, I refuse to even try hunting for the same reasons as you, but I LOVE technology! I don’t do 8 out of these ten things as well. You have been book marked because what I have found really makes cents and sense and since.. maybe not that one. Technology hates me. I’m not so fond of it either. Housekeeping and I aren’t great friends, although I am trying to cultivate a friendship with it. Right now it’s basically the big things, like finding my floor. I doubt I’d be able to hunt. It seems to take too long. But I’d love the meat. Washing the car can be fun but I never do it. I try to floss regularly. Getting in the habit is hard but I don’t mind doing it. Sometimes, like after eating pulled pork, it is essential. I can sing. Really well, in fact. But I rarely do it anymore. Hmm, I think I may need to get back into doing things. As far as scrapbooking goes… I have a box of all the ‘mementos’ that are supposed to be scrapbooked. Because, you know, I’m sure I’ll get around to it someday. I didn’t use to floss. Then I heard (repeated) that it could add 10 years to your life. I started visualizing those 10 years…..I now floss. so many of you “I DO NOT”s are the same as mine! I have to tell you something funny that my dentist told me when trying to convince me of the importance of daily flossing. Somehow that thought has motivated me to floss (and ignore the mirror mess it makes) with more frequency. But you shower, so it’s all good! Uhhh, I do. Huh. I need to add that to my list. I’ve been too busy on Pintrest to shower. Ahem. I totally LOL’ed at your “I don’t hunt” reasonings! I wouldn’t be able to stop coming up with stuff to talk about! That is totally me! I cannot beleive this. It was as if I was writing about my list. Every single thing here, I DON’T DO!!!! Just found your site and enjoyed reading some of your past posts. Thanks Brenda! 🙂 Welcome to our group. I’ll crochet you whatever you want. Well, we have kids for a reason. Ha, ha! I don’t do most of these things either! I’m no good luck on a fishing trip and the one time I endeavored to clean the windows they were awful afterwards…Thanks for sharing! Thank You! I don’t do any of those things either. 🙂 Welcome to the club! We’re just alike, except for the singing part. I, on the other hand, have a wonderful voice just like Dolly Parton or Taylor Swift or somebody like that. You just have to keep singing at the top of your voice and one day you will realize how good you are. It works. Really. I don’t wash my car or scrapbook. I do vacuum my car because of all the nature and children. But washing? Like once every couple years. Or when my car got egged.